Gallia Academy sophomore Alex Barnes jumps in the air to land on home plate while celebrating a fourth inning home run on Wednesday night in a Division II sectional softball final against Unioto at the Eastman Athletic Complex in Centenary, Ohio. 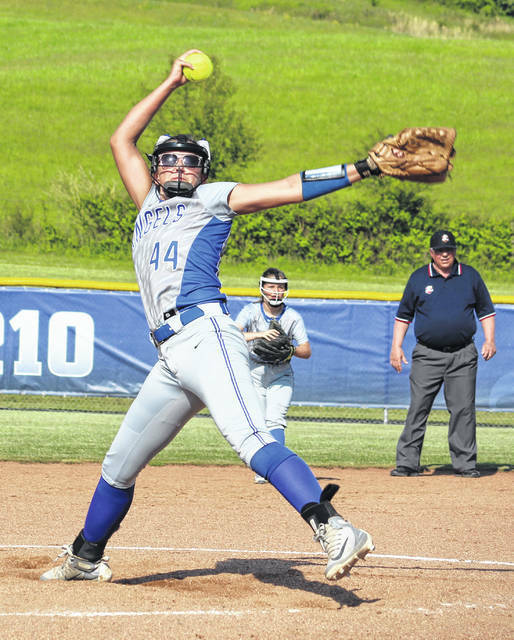 Gallia Academy starter Hunter Copley winds up to deliver a pitch on Wednesday night in a Division II sectional softball final against Unioto at the Eastman Athletic Complex in Centenary, Ohio. CENTENARY, Ohio — Thorough, from start to finish. 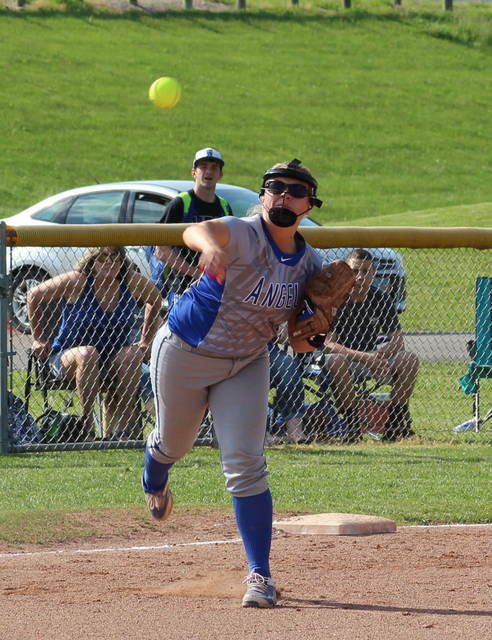 From small-ball to the long ball, or just the defense behind the pitching, the Gallia Academy softball team put together a dominant performance on Wednesday night while claiming a six-inning, 10-0 victory over visiting Unioto in a Division II sectional championship game at the Eastman Athletic Complex in Gallia County. The fourth-seeded Blue Angels (18-5) captured all the momentum in the opening frame as the hosts came up with a big defensive play and followed it up with an even bigger offensive gem that led to a permanent advantage. Hallie Pinkerton started things for the Lady Shermans (13-12) by reaching safely on an error, then stole second and moved over to third on a dropped third-strike conversion. Josie Fisher tried laying a sacrifice bunt down to get the run in, but pitcher Hunter Copley fielded the ball and went straight to first baseman Allie Young — who then fired a bullet straight to catcher Ryelee Sipple at the plate. Sipple applied the tag to Pinkerton in time, completing a double-play that allowed the hosts to get out of the inning unscathed. The Blue and White had Bailie Young reach on an error to start the home half of the first, then Alex Barnes bunted her way on board to put runners at first and second with nobody out. Sipple followed with a double to center that plated both Hailie Young and Barnes, making it a 2-0 contest through an inning of play. UHS had runners at first and third with nobody out in the second, but ultimately came up short on generating any kind of offense. The guests also had a runner thrown out at home trying to score on a Fisher single with two away in the third. 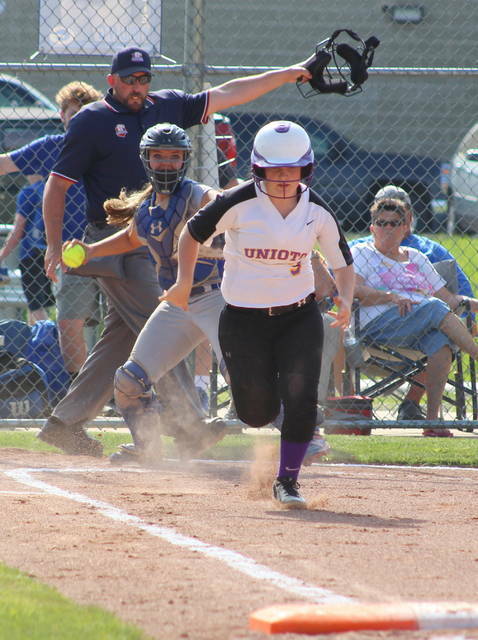 Fifth-seeded Unioto mustered only one hit and four total baserunners after the third inning. Sipple extended the GAHS lead to three after drilling a 2-1 offering over the left-center field fence to start the home half of the third, then Barnes blasted a two-out, full-count, two-run shot over the left-center field wall in the fourth that increased the lead out to 5-0. The Blue Angels wrapped things up in the sixth as Barnes started the inning with a bunt single, then advanced to second on a passed ball and came around to score on a Sipple single that made it 6-0. Chasity Adams followed with a double to left-center that allowed Sipple to score from first. Adams moved to third on the relay throw to the plate, then crossed home plate on a wild pitch that made it 8-0 with nobody out. 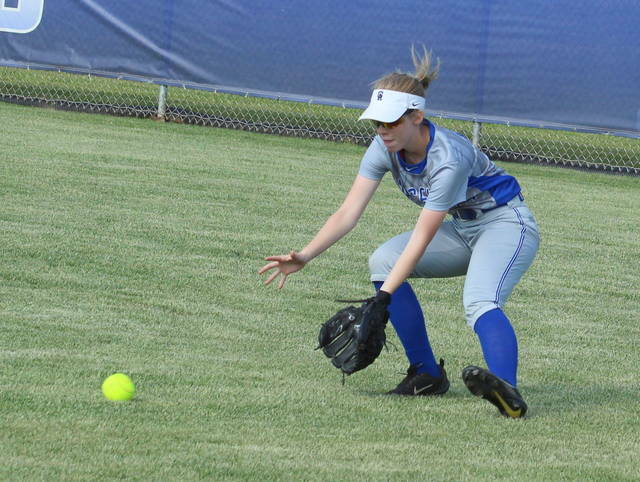 Malerie Stanley produced an infield single and later scored on a one-out double by Allie Young, then Copley completed the mercy-rule triumph with a single that plated Young for a 10-0 outcome. Both teams committed three errors in the contest, but Gallia Academy surrendered no runs from the miscues and also turned a trio of double-plays in the game. Unioto, conversely, allowed only one unearned run — the first one that ultimately proved to be the game-winner. The Blue Angels outhit the guests by a sizable 13-4 overall margin and also stranded nine runners on base, while the Lady Shermans ended up leaving six on the bags. Gallia Academy — which qualified for the Division III district tournament a year ago — repeated as sectional champions for the first since the program three-peated from 2010-12. The Blue Angels appeared in the district final in 2012 and qualified for regionals in 2010. Afterwards, GAHS coach Scott Stanley spoke about how well his troops played while achieving another preseason goal. Copley was the winning pitcher of record after allowing no runs, four hits and two walks over six frames while striking out five. Pinkerton took the loss after surrendering nine earned runs, hits and two walks over 5⅓ innings while fanning three. Barnes and Sipple led the hosts with three hits apiece, followed by Adams, Copley and Allie Young with two safeties each. Stanley and Bailie Young also had a hit each in the triumph. Sipple knocked in a game-high four RBIs and Barnes also drove in two runs. Fisher, Haley Holt, Payton Britton and Jersey Paul had a hit apiece for the Purple and Gold. The Blue Angels advance to the D-2 district semifinals being held at Ohio University. 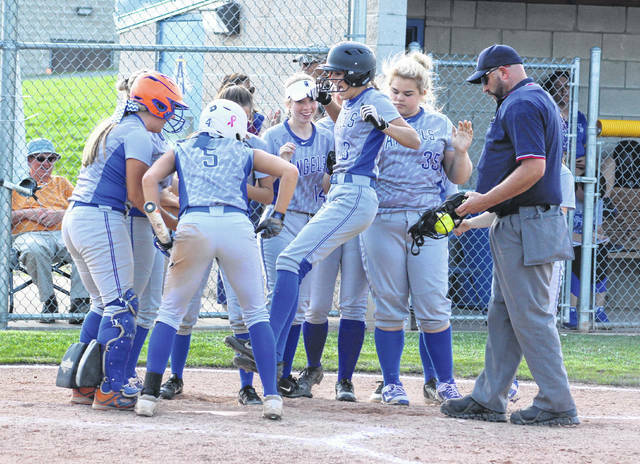 Gallia Academy will face top-seeded Sheridan at 5 p.m. Monday after the Lady Generals posted a 6-5 decision over eighth-seeded Logan Elm in eight innings. The Blue and White are facing a bit of a task in top-seeded SHS, but Stanley believes that his girls are ready for the bigger stage.